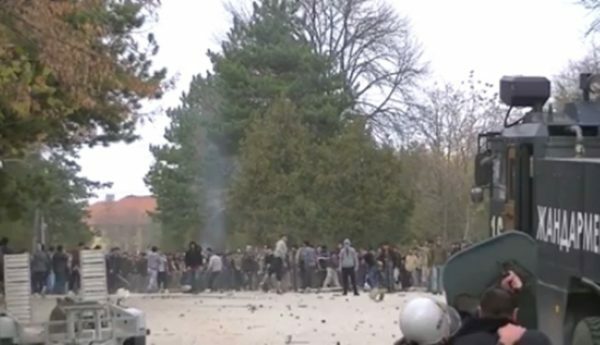 Nineteen foreign citizens face criminal charges, mainly for hooliganism, after the unrest at the refugee centre in the southern Bulgarian town of Harmanli, Prosecutor’s Office spokesperson Roumyana Arnaudova said on November 27. Eighteen face charges of hooliganism and one has been charged by the Special Prosecutor’s Office for vandalism and burning the Bulgarian flag, the latter offence carrying a penalty of up to two years’ imprisonment or a fine. The charges of aggravated hooliganism carry a penalty of up to five years in prison. Arnaudova said that prosecutors had not yet received any information from an investigation by the State Agency for National Security into whether people at the Harmanli refugee centre had links to a radical Islamist group. She said that prosecutors were aware of allegations on social networks that police had assaulted residents of the centre. No police officer had been indicted, but an investigation was continuing. Witnesses would be interviewed and phone video records examined. The Prosecutor’s Office would also ask for co-operation from television stations that had been reporting the events. Arnaudova said that there was no evidence that employees at the camp were to blame for the riots. “We have no information about the actions and inactions of officials who have provoked or assisted the occurrence of these disturbances,” she said. She said that so far it appeared that the main cause of discontent at the camp was the desire of some of the migrants to leave Bulgaria and to travel on via Serbia to Western Europe. Several days ago, the camp was placed under quarantine, reportedly because of skin diseases. “The intention and desire was to travel to Western Europe and the complaints are mainly about their poor living conditions,” Arnaudova told public broadcaster Bulgarian National Radio. The director of the camp, Dimitar Zahariev, told BNR that living conditions at the Harmanli centre were “normal” and the main reason for the rebellion was that people in the camp wanted to leave to move on to Western Europe. Zahariev denied that the food was insufficient and said that people at the camp were given meals three times a day. Zahariev said that the situation at the Harmanli camp. He also saw no blame among the staff for the revolt. He said that medical personnel were always present at the Harmanli camp. There were five doctors. Since October 4, there was a GP at the camp, leading a team that included another GP, a paediatrician and obstetrician. Zahariev confirmed that Syrians in the center had refused to participate in the revolt. “The people from Syria did not involve themselves in this rebellion – they did not want this to happen,” he said. Reportedly, the vast majority of those involved in the clashes with police were people from Afghanistan. On November 25, the day after the clashes, Foreign Minister Daniel Mitov held talks with the acting head of Afghanistan’s embassy in Sofia, to discuss the Harmanli incident and issues related to illegal migration.